"This Organic Surge collection wraps you up in nurturing moisture to protect your skin and hair from the effects of cold, windy weather and indoor heating." 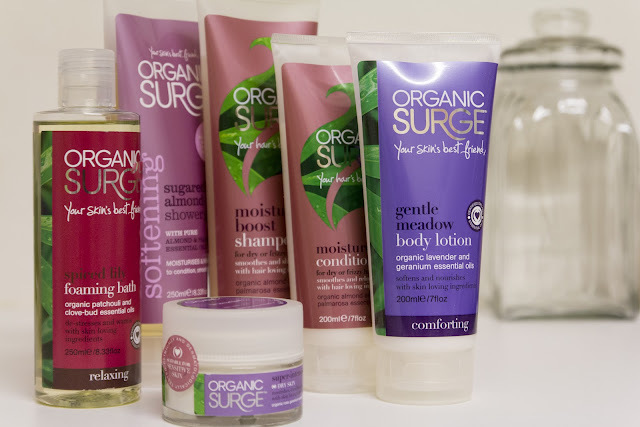 This wonderful little bundle of wonder has the best Organic Surge products in it. Especially when some of the items are ones that I had mentioned I wanted to try, in a previous post. ♥Like the beautiful Sugared Almond Shower Gel. It smells delicious! It contains Organic Almond and Palmarosa essential oils, and leaves your skin super smooth and soft. Such a nice change to the average shower gels and soaps. I love. ♥One product in the bundle is a little special to me. It is the Natural Spiced Lily Foaming Bath. This produces a very foamy bubble bath! It is Amazing. It contains sensual Patchouli and Spiced Clove-buds, which is my favourite, because it smells like Christmas! And we all know how much I love Christmas! ♥The Moisture Boost Shampoo with the Organic Vanilla and Almond fragrance is so good for my hair. It cleanses the hair and scalp without removing their natural protective oils. This is perfect for me as I wash my hair daily. The shampoo really does 'boost' my hair. It smooths and rehydrates and makes it look so healthy. The smell is just so tasty too, my hair smells like a delicious dessert- Perfect. ♥The Moisture Boost Conditioner does the same, though I do need to use quite alot as my hair is naturally tangly. Possibly due to the amount of dye I have made it put up with! I usually use an intense hair masque to condition my hair. But this conditioner will be perfect for yours! I have been using this every other day to my hair masque and my hair has just been heavenly! ♥Oh, the Super-Intensive Daily Moisturiser is divine. My face feels so soft and smooth and smells wonderful! This moisturiser is THE perfect partner for the Daily Care Face Wash that I reviewed in my previous post. 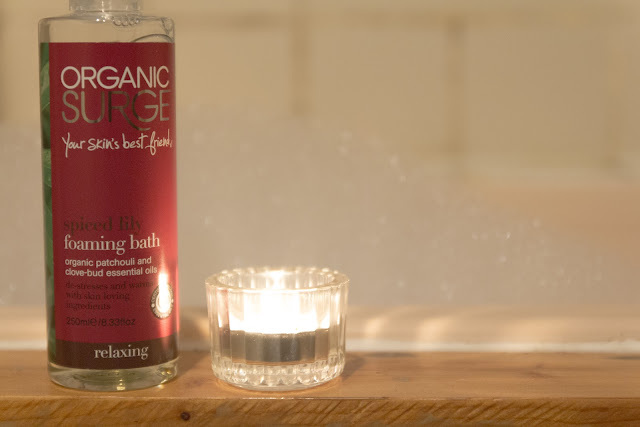 Like the face wash, the organic Rose Geranium essential oil smells alot like Turkish Delight. Favourite. The cream is so easy to apply and you do not even need alot of it. ♥The Gentle Meadow Body Lotion is instantly in my top three. It is enriched with organic Lavender and Geranium essential oils. Lavender is my saviour, such a wonderful scent. This Lavender infused moisturiser helps to de-stress and lift your mood. It instantly lifts my mood with how smooth and soft my skin feels after a little application. It is quickly absorbed to protect from dryness. Perfect for these cold days. In conclusion... This brand is my ultimate favourite, and I am positive in saying I am their number one customer. For life! I wish there was a way to show you in picture form how Amazing these products smell, like a magic portal for scent. Or a 'scratch and sniff' sticker. Divine. This Winter Wonders Bundle is the perfect gift for Christmas. For you or Mother. It is an even better gift for your skin through the month of January. Protect yourself from the Winter cold for only £29.99! Treat yourself. Treat your skin. After all, It is 'your skin's best friend'!